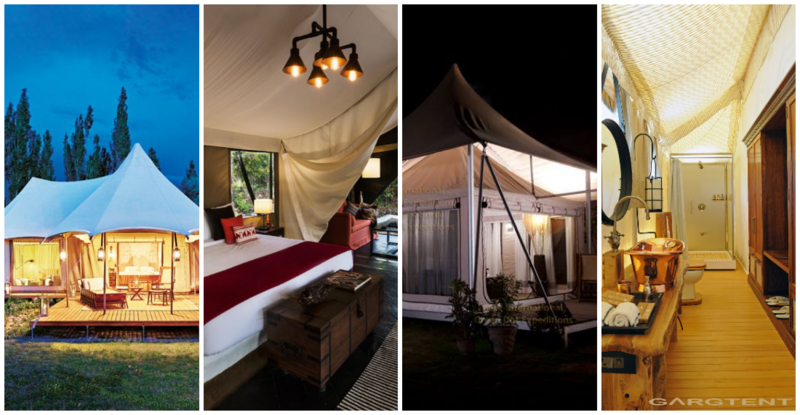 Our Resort Tents are ideally suited for Glamping, Retreats, Resorts, Homes and Ecotourism operations in environmentally sensitive areas. There is definitely a low impact on the environment during and after the construction stage, with the finished tent fitting aesthetically into the environment. The finished product would allow a unique concept that is perfectly suited to almost any environment whether it be desert, tropical rainforest or coastal dunes. On top of that, the tents are relatively inexpensive, environmentally sensitive and above all extremely comfortable and elegant. 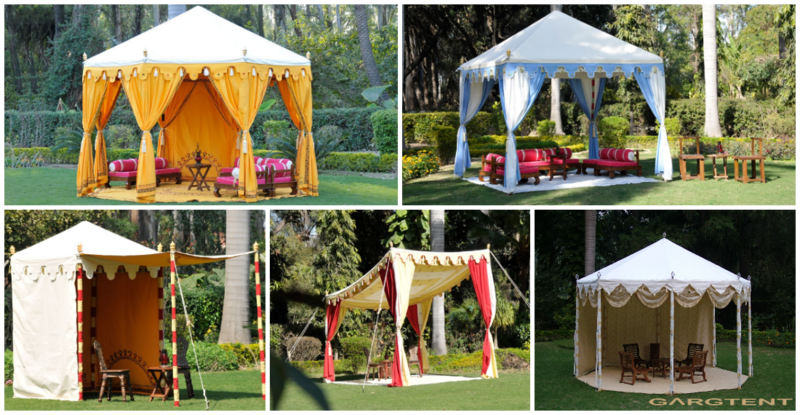 GargTent has a superb collection of Raj Tents, Garden Tents, Mughal Tents and Tent Furniture for sale. 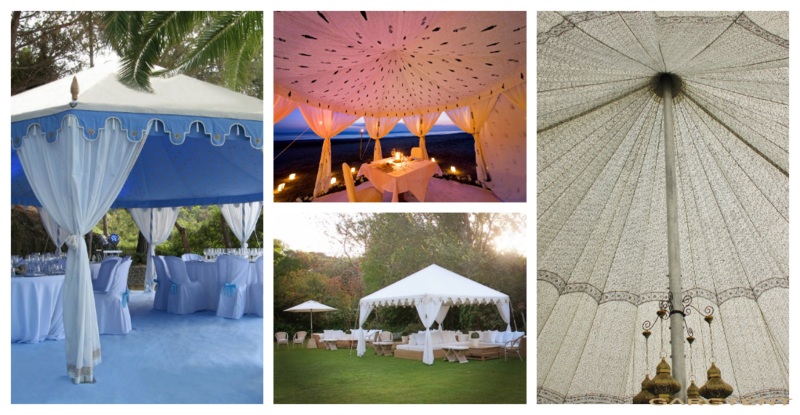 These are ideal for use as wedding tents, in a private garden, at a hotel for outside dining during the summer months and many more applications. All our tents only take a few hours to erect, therefore, be pulled down just as quickly. No tool required. Our in-house Resources and innovative products, including hand block printing, enable us to create imaginative, bold, elegant, fun and environments cost-effectively. GargTent offers a high degree of customization to make your tent unique. 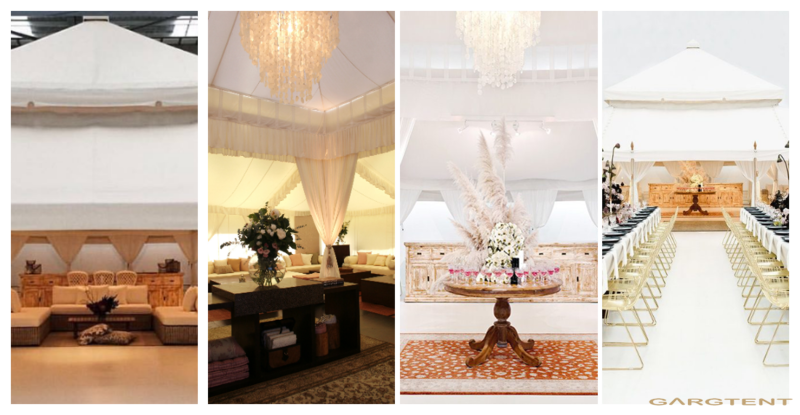 Let us work with you to develop your dream tented theme. For those who dream of a gateway to far away India our collection of these umbrellas are the next best thing. Our exciting range of these beautiful umbrellas in vibrant colors is reputed for their durability and multi-utility. Make these breathtaking beautiful umbrellas your own, producing stunning effects to any outdoor or indoor space. Our linings provide a glimpse of the many patterns that we have created for our clients internationally. 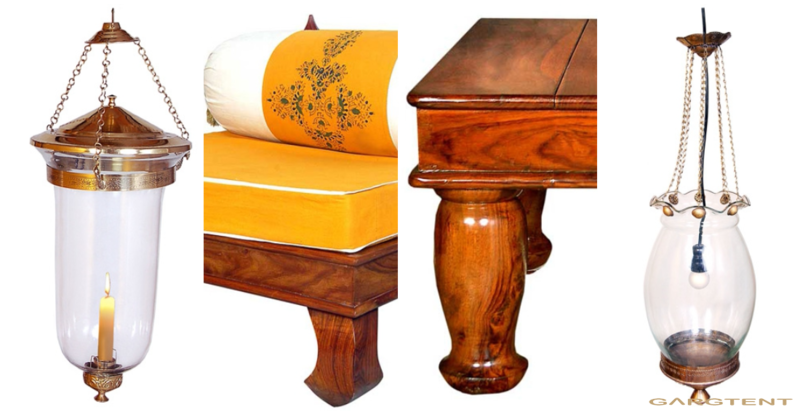 Many provide a “touch of India” by incorporating traditional motifs in many colors and styles. These linings are made of Trevira CS, inherently fire retardant complies to BS 7837:1996, BS 5867 part 2 type B, CPAI 84:1995 Sec 6 and NFPA 701. Wood block printed bed Sheets, pillow covers, cushion covers, quilts, duvet covers, drapes, table cloths and a range of beautifully printed fabric, to add style and comfort to your home. Block printing is a very skilled process as just the right amount of pressure has to be applied and this varies from block to block depending on size.